The president says he did not make any deal to win the man's freedom. 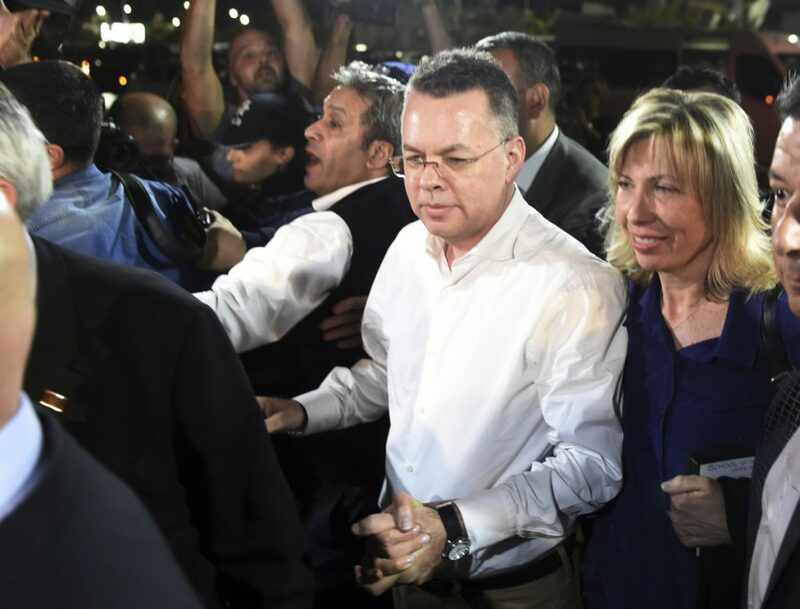 WASHINGTON — President Trump awaited an Oval Office meeting Saturday with Andrew Brunson, the American pastor who returned to the U.S. around midday after he was freed from nearly two years of detention in Turkey. Word of Brunson’s arrival back on American soil Saturday came from Tony Perkins, president of the Family Research Council. Perkins tweeted just after noon that he had landed at a military base outside Washington with Brunson and his wife, Norine. There was no immediate confirmation from the White House. “It will be wonderful to see and meet him. He is a great Christian who has been through such a tough experience,” Trump said in a tweet confirming a White House meeting set for 2:30 p.m. The president also asserted anew that he had made “no deal” with Turkey to win Brunson’s long-sought freedom. “I don’t make deals for hostages,” he said. Trump also thanked Turkey’s president, Recep Tayyip Erdogan, who had resisted the demands of Trump and other high-level U.S. officials for Brunson’s release. Erdogan had insisted that his country’s courts are independent, though he previously had suggested a possible swap for Brunson. The Trump administration had repeatedly called for Brunson’s release and, this year, sanctioned two Turkish officials and doubled tariffs on steel and aluminum imports. Trump said the U.S. greatly appreciated Brunson’s release and said the move “will lead to good, perhaps great, relations” between the U.S. and fellow NATO ally Turkey. Erdogan responded to Trump on Twitter, saying that “as I’ve always emphasized, the Turkish judiciary made its decision independently. I hope the U.S. and Turkey will continue its cooperation as it befits two allies.” Erdogan also called for joint efforts against terrorism, and he listed the Islamic State group, Kurdish militants and the network of a U.S.-based Muslim cleric whom Turkey blames for a failed coup in 2016. Relations between the countries have become severely strained over Brunson’s detention and a host of other issues. Brunson’s homecoming amounts to a diplomatic high note for Trump, who is counting on the support of evangelical Christians for Republican candidates in the Nov. 6 election. Thousands of Trump’s supporters cheered Friday night at a rally in Ohio when Trump informed them that Brunson was once again a free man. “I’m really proud to report that earlier today we secured the release of pastor Andrew Brunson from Turkey,” Trump said. Brunson, a North Carolina native, was due to arrive at Joint Base Andrews near Washington about noon. Trump reminded the Ohio audience of other detained Americans who regained their freedom under his leadership. They include three Americans released this year by North Korea before Trump’s historic meeting with North Korean leader Kim Jong Un, and an Egyptian-American charity worker freed by Egypt in 2017. “We bring a lot of people back and that’s good,” Trump said. “I love Jesus. I love Turkey,” an emotional Brunson, who had maintained his innocence, told the court at Friday’s hearing. He tearfully hugged his wife, Norine Lyn. Brunson’s release could benefit Turkey by allowing the government to focus on an escalating diplomatic crisis over Jamal Khashoggi, a Saudi contributor to The Washington Post who has been missing for more than a week and is feared dead after entering the Saudi consulate in Istanbul. Turkish officials suspect Khashoggi, a critic of the Saudi government, was killed in the consulate; Saudi officials deny it. But Brunson’s release doesn’t resolve disagreements over U.S. support for Kurdish fighters in Syria, as well as a plan by Turkey to buy Russian missiles. Turkey is also frustrated by the refusal of the U.S. to extradite Fethullah Gulen, a Pennsylvania-based Muslim cleric accused by Turkey of engineering the failed coup.